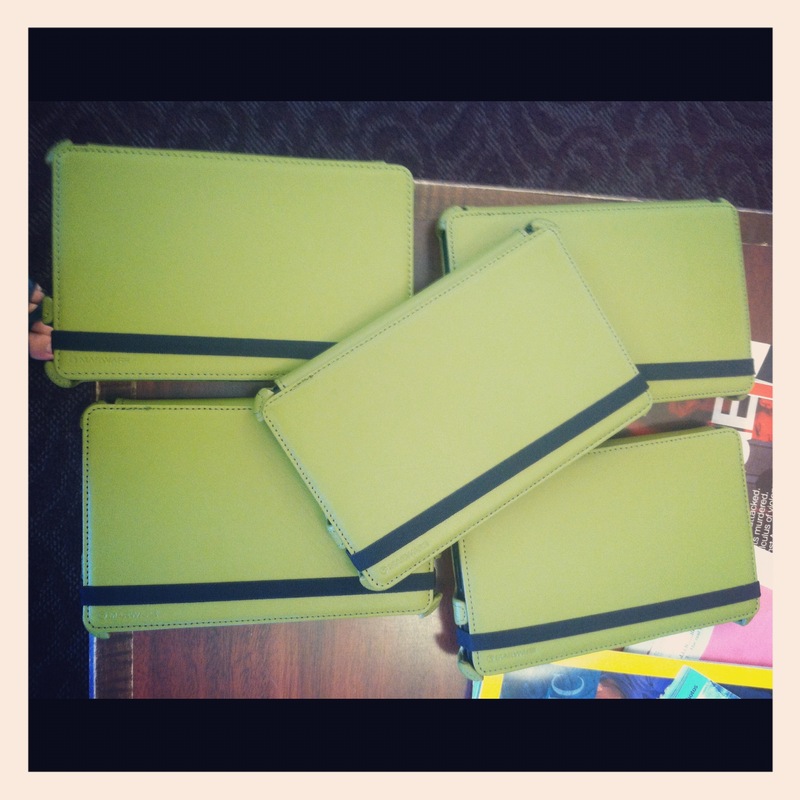 Vagabond Librarians Day 6: Convocation! So, Condaleeza Rice spoke to us today. At Hopkins. That is pretty cool. Personally, I thought the best parts of her speech were when she was talking about trying new things, broadening your range of knowledge, and being open to different opinions. We’ve definitely been trying new things here at the Vagabond Library – from our new reliance on our Kindles to our wall-less workspace. And while there are some drawbacks to the current situation (I miss you, books), there are benefits as well. It’s great being in the thick of campus (and not just because we got to people-watch the reception in the Weissman Room). We’re broadening our range of experiences up here – and we’ll be taking what we’ve learned back to the library with us. For another voice on education and the importance thereof, I refer you to John Green’s video “Is College Worth It?” (If you do not know who John Green is, please see Ms. Barrows review of The Fault in Our Stars and her upcoming review of An Abundance of Katherines). This entry was posted in Hopkins, Librarians and tagged Convocation, Education, John Green on September 27, 2012 by Mr. Gette. Vagabond Librarians Day 5: Who IS The Boss? Jenny Barrows here to bring you the latest edition of the Moldy, ahem, Vagabond Library. Last week, I saw Tony Danza speak in a Madison, CT middle school auditorium. FYI, Tony Danza is not the washed up type (nor will he ever be the washed up type) who can only speak in middle school auditoriums. He was brought to Madison by the very awesome RJ Julia Independent Booksellers. Rather than holding the event at RJ Julia, Tony D spoke in the auditorium so more people could attend. And by the way, it was a packed house. Also, if you don’t know who Tony Danza is. Click the above link or view the photo below. After being fired from his last “big shot celebrity job”, Danza decided to fulfill a long-abandoned dream and become a teacher. He taught for a year at Northeast High – Philadelphia’s largest high school with 3,600 students. Not entirely ready to shed the habits of stardom, he wrote a book about the experience: I’d Like to Apologize to Every Teacher I Ever Had. Despite being a former prize fighter and big shot celebrity, Danza got knocked down in a few rounds of teacher v. students (and Danza v. other teachers). Despite the roller coaster, Danza’s mantra remained: make the best of a bad situation. The Calarco Library is not in a bad situation (read about some libraries that are), more of a “less than ideal” situation. Are we crying about it? Please. It takes far more to break the Vagabond Librarians (and no we did not choke up when we took our last look at the books for 2 entire weeks…that never happened). In the spirit of Tony Danza, we are making the best of our situation. Librarian Gette is fantastically conveying the secret intricacies of research, while Teacher Ford and the AC1 students enthusiastically adapt to the less-than-perfect classroom environment. How has Hopkins made the most of a situation? Lets review. Student patience regarding printing has at least doubled, if not tripled. Students come to the Vagabond Library with incredibly original jokes such as, “Oh man, look at all the books!” And while we guffaw initially, we trump expectations and students end up leaving with one of our fabulous Kindles hugged close to their chests (or shoved into a backpack. We’re realists.). Tony Danza is a wise man, and his advice should be cherished. I mean c’mon, he is the boss. This entry was posted in Humor, Instruction, Librarians and tagged Humor, Kindles, Librarians, Library, Library Instruction, Literacy, Teaching, Tony Danza on September 25, 2012 by Jenny Nicolelli. Vagabond Librarians Day Four: Instruction Junction, What’s Your Function? I did. And other than the core courses in cat ownership and selecting just the right horn-rimmed glasses, I learned two things: how to catalogue, and how to teach. Even though we are away from the library and its classroom, we can still do all of that. It just looks a little different, like the Kindles vs our usual book collection. Maybe your class will come up to Heath, or maybe a librarian will brave the light of day and come to your classroom. If you need help doing research, we’re here. And we have comfy chairs. So schedule an individual appointment (in fact, someone made an appointment while I was typing this). And we will always happily tell you where the nearest copier is. It’s what we’re trained for. This entry was posted in Hopkins, Librarians on September 24, 2012 by Mr. Gette. Ed: We interrupt your normally scheduled mold/library report to bring you this breaking book review. I read I Am The Messenger over the long weekend. I’m still not sure how I feel about it. Am I glad I read it? Yes. But the book is bothering me, and all because of the ending. I can’t decide if it’s brilliant, or…something else. Which is too bad, because so much of the rest of the book is brilliant. A guy who everyone thinks is a loser (especially himself) gains minor fame after sort-of foiling a bank robbery. Soon after, he receives a playing card in the mail. It has three places and times written on it. Ed’s been given a chance to make more changes in the world – if he can figure out what he’s meant to do. The book was darker than I thought it would be (though really, after reading The Book Thief I should have know). And some of the plot developments were extremely satisfying (though again, they surprised me more than they probably should have). I think I owe it a second reading, just to see what stands out to me now that I have a better idea of what’s going on. Got something to say about this book/post/what was for lunch today? Leave a comment! This entry was posted in Reader Advisory, Reading and tagged Book review, I am the Messenger, Reader Advisory on September 21, 2012 by Mr. Gette. Vagabond Librarians Day 3: You Know What Else We Miss? Super Powers. Batman: The Long Halloween. Scott Pilgrim. Watchmen. Fun Home. Owly. Sandman: Season of Mist. Yes. You heard me. I listed a bunch of graphic novels and italicized them. I promise, it was harder than it appears. Why was it harder, might you ask? Well, because the Vagabond Librarians have officially started adding graphic novels to the 6 Vagabond Library Kindle Fires. This is a difficult task for the following reasons: 1. We have to sort through dozens of lists claiming to be “The Most Accurate List Ever of Awesome Graphic Novels,” 2. We have to resist reading the beautifully displayed graphic novels all day, and 3. We really have to stop patting ourselves on the backs (shout out to Mr. Kit Gette for being the driving force behind this initiative). Awesome Student: Hi, Vagabond Librarian. 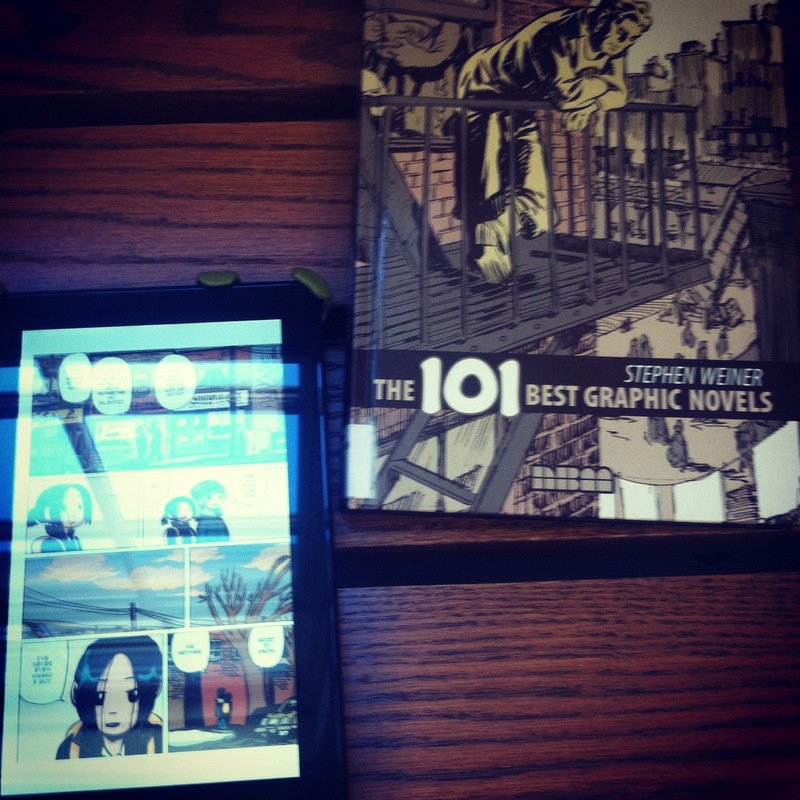 I am really interested in reading graphic novels on Kindle Fires for two reasons: 1. I hear the display is excellent and 2. Since you and your cohorts are extremely talented selectors of books, I am confident that the graphic novels on the Kindle Fires are great reads. Vagabond Librarian: That is great to hear, Awesome Student. I will absolutely assist you in checking out a Kindle Fire and learning the panel view feature. Awesome Student: Thank you, Vagabond Librarian. By the way, you and your cohorts should really pat yourselves on the backs for this great initiative. Don’t you want to be that awesome student?! Visit the Vagabond Library and fulfill your dreams. In other Vagabond Library news: 2 students seeking quiet hid in the Dining Hall to study, and Dr. Kellie Cox is “The Law”. This is the back of the book. Go to the other end of the book and start at page 1. Your mother and I are very disappointed in you. OPTION 1: Follow the balloons from left to right and top to bottom, then move on to the next panel, the way you learned it at that sissy school of yours. OPTION 2: Read each balloon in whatever order appeals to you most. Freestyle! It’s your book now! Don’t let the man tell you which direction to read! This entry was posted in e-Readers, Librarians, Literacy, Reading and tagged Graphic Novels, Kindle Books, Kindle Fires, Reading, Vagabond Library on September 21, 2012 by Jenny Nicolelli. Not with a bang but a mold spore. Oh, you expected Ms. Barrow’s jolly platitudes? Ah. Right. Hello and welcome to Day 2 of the Vagabond Librarians! 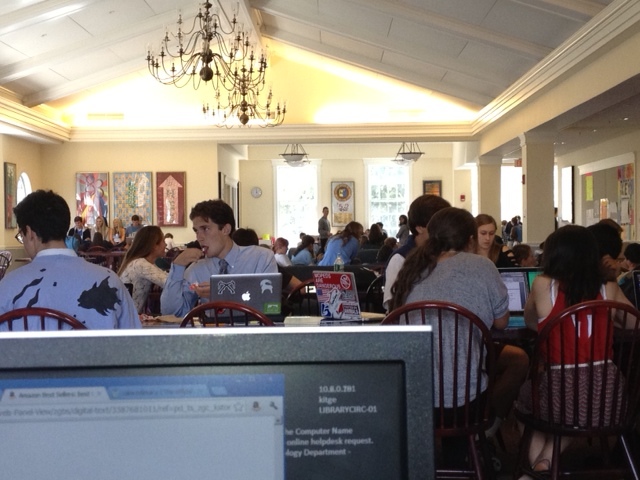 Strangely, it is almost business as usual here, with textbooks and laptops flying out the lack of doors. There is no Quiet Floor (and very little quiet), but there’s still a lot of studying going on. Yesterday Ms. Barrows talked about how a library is more than its space or its books. I certainly agree, and I also wanted to talk about how we still have plenty of good old-fashioned library books available to borrow and read – just maybe not in the format you’re most familiar with. As you may know, the library has 18 Kindles available, with an archive of over 200 books. What you probably don’t know is we have 12 brand new Kindles, especially intended for Junior School borrowers. We’ve also purchased over 50 new Kindle books, now available on said Kindles. And while they may be tagged JSchool, I think the books will be appealing to a wide range of readers. Titles include: The Maze Runner, The Perks of Being A Wallflower, The Hobbit, Divergent, Graceling, Enclave, The Wee Free Men, Black Hole Sun, Leviathan, and Cassandra Clare’s Mortal Instruments series. And – as always – if there’s anything you’d like to read on the Kindles, let us know and we’ll see what we can do! So come on in and read something. Non-Library Moments In Heath Today You May Have Missed: Triple Trio singing “And So It Goes” to Ms. Calderone in the Bookstore, someone playing “Call Me Maybe” and “Payphone” on the piano in the Weismann Room. There are definite benefits to being more centrally located. This entry was posted in e-Readers, Humor, Librarians and tagged a capella, ebooks, Kindles, T.S. Eliot on September 20, 2012 by Mr. Gette. And so begins day one of the Vagabond Calarco Library. Our slogan: Calarco Library, Breaking the Mold. Witty, right? Maybe I should back up and explain why there is such a flattering photo of myself and Mr. Gette imitating Santa…in September…with black trash bags…sans white beards. For those who do not already know, or for those who have fallen victim to that elusive beast known as the “rumor mill,” the Calarco Library facilities are temporarily closed due to elevated levels of mold. As of right now, the estimated time of closure is 10 school days. Don’t fret! The Vagabond Library is up, running and ready for business. Maintenance kindly transfered 2 library laptop carts, textbooks, and a printer to Upper Heath this morning. 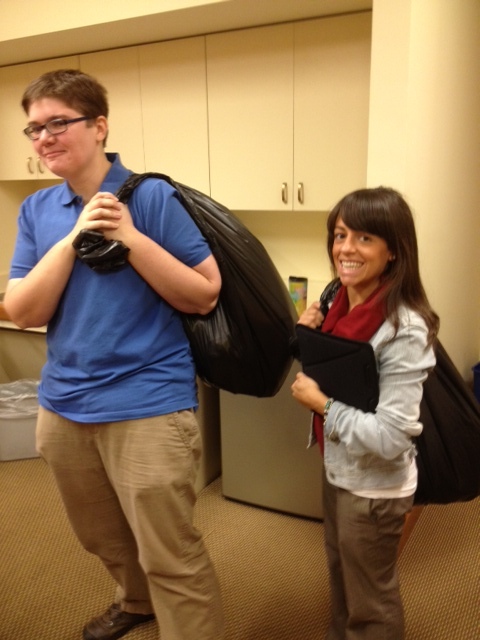 Even more resources were carried up in those fashionable bags modeled in the photo above. At the bottom of the post is a FULL list of services, as well as some fantastic photos depicting the progress of our migration. This is a great opportunity to remember that libraries AND librarians are so much more than books. A fellow school librarian, Buffy Hamilton, did a supremely awesome job of explaining what a library really is during her own dilemma last year. While I love my physical library space, that is not what I’m trying distribute throughout my building, but instead, it’s the experience of library and myself, the human resource and all the energy, expertise in many kinds of literacies, and desire to help students learn, that provides the most benefits to my school…As long as I have a space to teach in the building and the means to teach teachers and students, I can bring the experience of library anywhere. Not only do we still have the resources to offer books, magazines, databases and more, we still have…us! The physical library may be currently inactive, but the librarians certainly are not. Come visit us in Upper Heath for research assistance, technology help (Evernote, NoodleTools, Webspiration and more), printing, laptops, reading material, textbooks or a designated place to study. We cannot be defeated. Seriously, did you think daring librarians of fortune would really be stopped by a bit of mold? This entry was posted in Hopkins, Humor, Librarians, Uncategorized on September 19, 2012 by Jenny Nicolelli.